Ok, so here is things will get a little crazy. 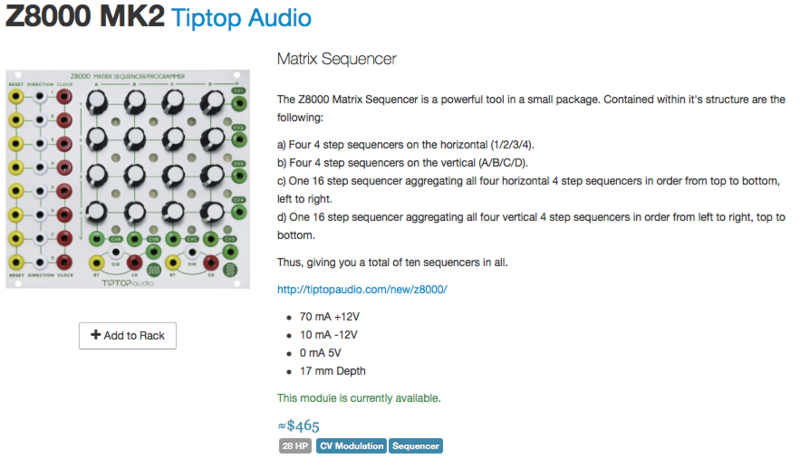 As I mentioned before Modulargrid.net has a nice portion of the website where you can build your synth. Better still, you can see what other people are building. So here is what I have laid out so far. Crazy right? There is almost $3,000 worth of modules laid out in that rack matching what the Mantis can hold. So what exactly do I have going on here? Let's break it down and I'll explain what I know so far about how this can work. Keep in mind that these may be acquired over months if not years. The first two items that I really should probably get is a sequencer. One or both of them may end up changing as I continue research on sequencing techniques and what I may want to get out of a sequencer. I am currently trying to find out more information about CV/Gate sequencers, which are small little sequencers that can be manipulated with other cv/gate data. So the first module is the Stillson Hammer Mark II. Two things are immediately attractive with this sequencer. 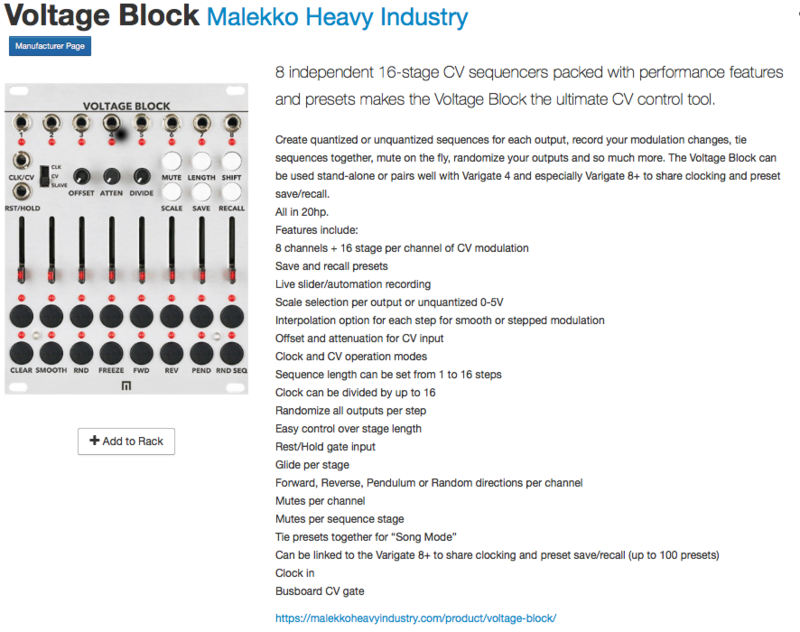 It features up to four tracks of sequencing with CV/Gate. That right there allows me to get the multiple tracks I need to get a groove sort of setup. The analog sliders also make for quick sequencing capabilities. 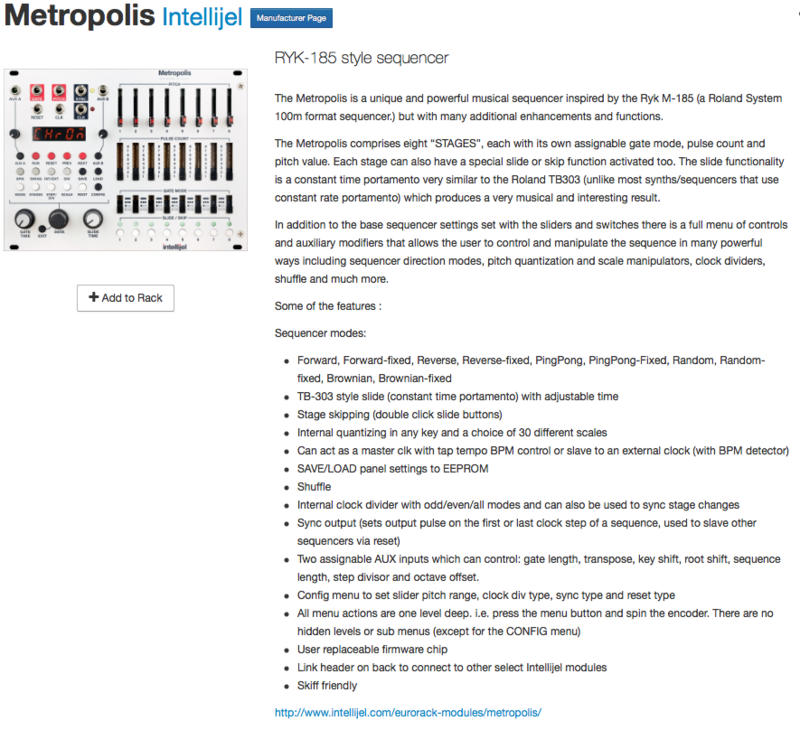 The second sequencer is the IIntellijel Metropolis. At first glance you might think that these things basically look the same and they are in fact very similar. The Metropolis only has one track which it can sequence, but it utilizes a unique feature with the 8-stage switches on it. It is hard to describe and best if just shown in the video below where you can see how unique it is. 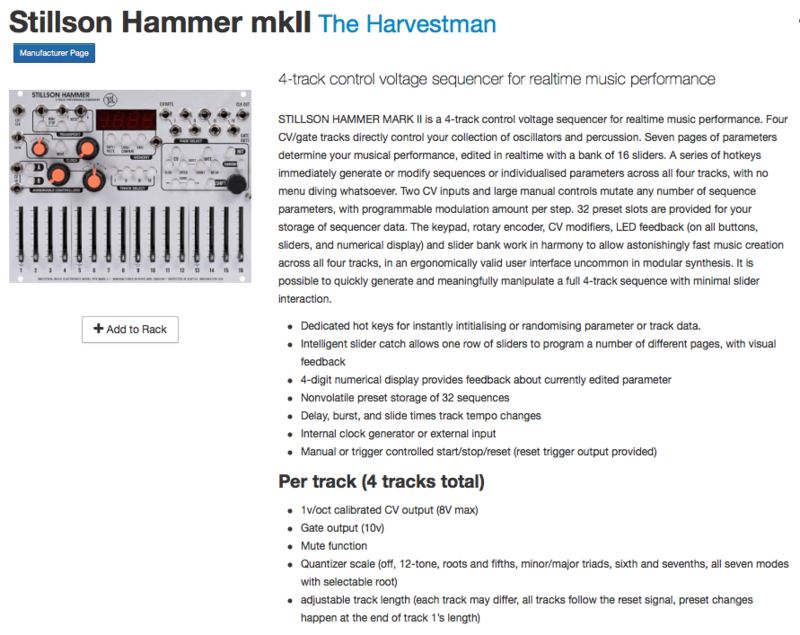 So both of those sequencers are very cool, but they are also very expensive, around $600 each. As you can see from the rack posted at the top, they also take up a ton of space. There are all sorts of cool alternatives out there. Unfortunately I am at a loss on exactly how to use them. Here is a quick list of the ones that have caught my eye so far though. This is another super popular sequencer. It is a bit cheaper, but works on a grid matrix. Very cool because this one can be easily "stacked" with the Varigate 8+. The list goes on with problematic sequencers, euclidean sequencers and cartesian sequencers. I'm sure there are even more. 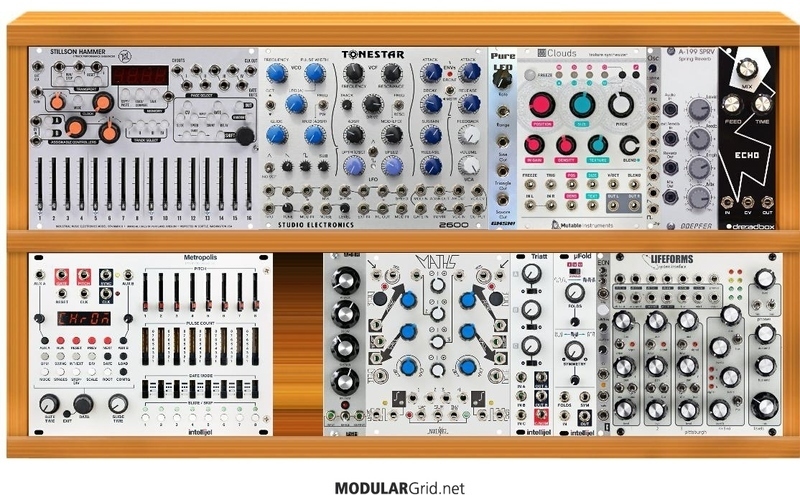 Journey into Modular Synthesis - Part 1: Why Modular Synthesis? I'm always on the lookout for trying to expand my musical creation capabilities with my synths setup. If you recall, a few years ago I was exploring a change in my groove box setup. I researched a lot of ways to try and mix up my sound. In the end I ended up getting a Waldorf Blofeld and a Tech 21 Flyrig 5. Fast forward a couple of years and I am now once again looking for something different for music creation. This time around though I am not going to try and change my core musical setup. Instead I am going to try and create a new "workstation" of sorts. Now, I have been exploring some various options over the past year ranging from the Korg Volca series, to the Teenage Engineering PO boxes, to even a workstation keyboard like the Roland FA series. I put most of those thoughts off to the side as I tried to finish my album last fall, (buy it btw) and I am once again back looking for something new. I have looked at modular synths in the past, but they have always frightened me off. The shear cost alone is intimidating and the completely opened ended nature of the market, with hundreds of modules, by dozens of different manufacturers is confusing. Coming from a "traditional" synthesis world I have a better grasp than most on what VCO's are and how envelopes and LFO's work. But modular synths, are something radical. So last Wednesday I woke up in the morning to put the news on while I prepared breakfast and found that what should have been the ABC 7 morning news was now a black screen that said "scrambled" across it. Slightly disappointed, I figured that the cable must have just been down. Minor hiccups like this have happened before and I have needed to re scan my TV. I did the re-scan and found that all of my channels were still scrambled, but I did have two Xfinity promotional channels that were available. I went online later that day and did some research online and unfortunately found that Comcast has decided to encrypt all TV channels, even broadcast channels on limited basic cable. My research turned up this help file that was published September 4th. This means that where you previously could get HD broadcast channels with the QAM tuner in your HDTV you now have to have a set top box to receive any channels at all. 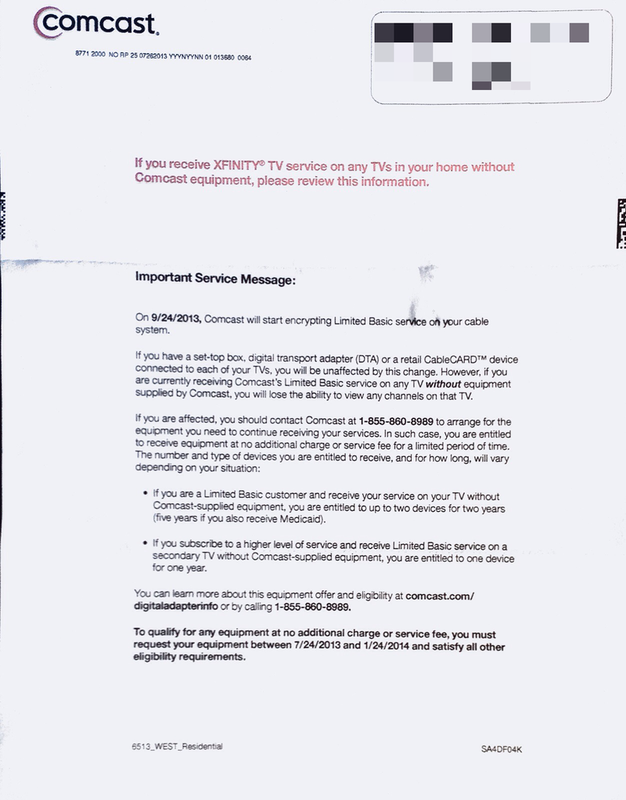 A follow up call to Comcast later that day confirmed this message and after going back through my previous bills I did note that I receive the following letter in the mail from them. I think the thing that bugs me the most about this whole ordeal is just how unnecessary all of it is. Limited Basic cable was costing me $28 a month. To require a set top box so Comcast can further try and push their marketed services upon me is just slimy. It reeks of underhanded business practices and it unfortunately puts customers who are far away from broadcast towers (45 miles or more) at a major disadvantage. So I canceled my cable TV right there on the spot. If I had another good internet provider I would have done so with that as well. My resolution was set then to setup an antenna in my home to get broadcast TV. My search started over at antennaweb.org . This is a great website that allows consumers to put in their address to find out what type of antenna they may need. The power ranking systems for the antennas are nicely colored coded to let you know what sort of power and size of antenna you may need. Everything in my areas based upon my location from the city put me in the yellow, red and light green area. I was therefore able to pick up a very straightforward antenna and mount it in my attic with no problems. I bought the RCA ANT751 which you can find for about $60 on Amazon. This antenna was nice since it is only about a meter long and it was very easy to mount. When I went through the actual installation process I ran into a couple of hiccups that I thought others should be aware of. Since I still use Comcast for my internet I found that the antenna signal and the cable internet cannot share the same coax cable since their frequencies overlap. I had to then go through my house to see how my coax was run and split up. Thankfully it was pretty straight forward. I had my cable connection come into the house through the basement and then run straight up to the attic where everything split off from there. All of the cables were nicely labeled as well.Since I had to separate things off I basically had to identify one room in the house to place the cable modem and resign the fact that I could not get antenna TV there. I actually opted to do this in the basement itself after trying a couple of other locations. I previously had drilled some holes in my floor for running speaker cable so I then ran my ethernet cable along the floor boards to run back up to my router located in the family room. Ultimately, the whole process worked out really well and was about as painless as it could have been.